The Upper Rhondda is surrounded by some of the most dramatic and natural resource rich landscapes in Wales. Over 70% of the of the land in the Upper Rhondda is in public ownership and although there is a limited Public Rights of Way network (e.g. 17km within the Treherbert Ward), there is extensive ‘open access’ (e.g. over 80% of the Treherbert Ward). 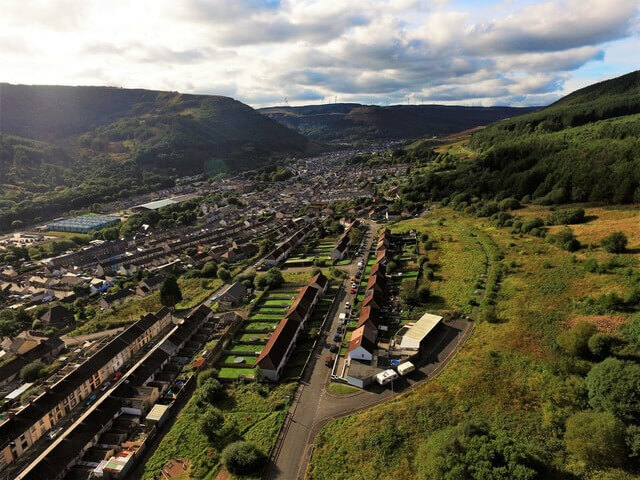 The strength of community groups and associations based around the mining workforce has left the legacy of a large number of assets in the Rhondda in terms of parks, structures (e.g. Pavilions) and buildings (e.g. Welfare Halls, Girls and Boys Clubs, Libraries). trengths they can use to design a future. . Welcome to our Woods operate from several sites geographically spread around the Upper Rhondda Fawr area and each providing various functions. 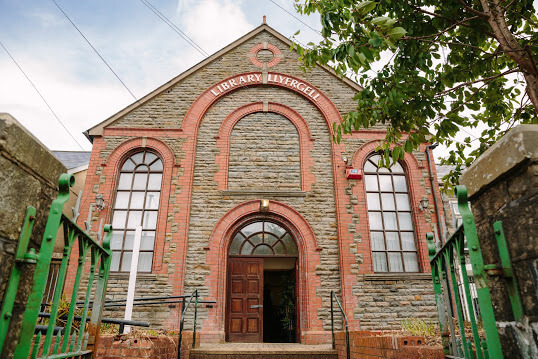 The old library building on Bute Street Treherbert, Adding economic and social value to woody materials, and engaging the whole community in our enterprise. Purchased by WTOW LTD in July 2018, located on the High Street in Treherbert, our drop in craft and wood workshop has proven popular with local people. We held a craft market with 10 other local crafters, footfall of over 100 per day. We’ve had community feasts and have begun to run OCN qualifications for economically inactive, who also have contributing health issues. This is where we intend high-end artisan and up cycled wood products to be produced by a range of local people and also a potential high street retail space. Community Allotment Growing Space in Tynewydd, Our growing site is located in Tynewydd Village Treherbert, a community accessible growing and learning space. PenPych Woodland Carpark and waterfall walk in Blaencwm. Fernhill Enterprise Site Development, The Fernhill 209acre ex-colliery site, situated next to PenPych woodland, the Rhigos Mountain Road and the Pen y Cymoedd Wind-farm site. The site has over 200 acres of land, derelict since pit closure in 1978. Due to its current good condition, we believe this site presents the best opportunity in the Upper Rhondda Fawr for developing new enterprises based on natural resources, with associated trackways passing through the site, and opportunities for biodiversity management. Construction at site will begin in March 2019 and first phase wood processing facility will have 5 distinct operations. A recycling workshop to design and process high value wood based recycled products from waste-wood and locally harvested natural materials. Operation of an 8kW Combined Heat and Power unit (CHP) to provide heat and power. Treherbert Square Development (former high street garage site Treherbert, A former petrol station site High Street Treherbert, is owned by Rhondda Housing Association and has been cleared and put safe by them. Now on long term lease with WTOW LTD, to deliver a phased development on the space working with local people. We have already engaged with over 250 local people during Oct 2018 consultations, regarding what the site should now be used for. Many of the community ideas were around sessional market space / community activity performance /cultural spaces, a place to learn new skills and meet people. Above is an exciting early idea of what our community think could be the long term future of this site: a multifunctional open access community space, free Wifi, a demountable bandstand /performance space made from local timbers, a space for artisan crafters to rent their secure lock up storage and undercover work/retail space. By April 2019 the first phase will be completed and the site will be available as an open air retail and pick-up space for our locally produced biomass products and recycled / up-cycled wood based products. CYS see cys info documents.. The critical difference between biomass fuels and fossil fuels is that of fossil and contemporary carbon. Burning fossil fuels results in converting stable carbon sequestered millions of years ago into atmospheric carbon dioxide. Burning biomass fuels however, returns to the atmosphere contemporary carbon recently taken up by the growing plant, and currently being taken up by replacement growth. If wood-fuel is sourced from ‘local well-managed woodlands’, then carbon released from the wood during combustion will be removed from the atmosphere as the remaining local trees and seedlings photosynthesise. Biomass is a “carbon lean” fuel producing a fraction of the Carbon emissions of fossil fuels. Biomass can be sourced locally, from within the Rhondda Valley and wider South Wales Valleys, on an indefinite basis. The establishment of local networks of production and usage allows financial and environmental costs of transport to be greatly minimised. All contributing to security of supply for our customers and our own businesses sustainability. Locally sourced biomass can offer other local business opportunities and support the wider economy. The use of biomass fuel provides local people an economic incentive to better manage the local woodland which improves biodiversity and creates local employment opportunities. Use of wood and all wood-based products are associated with lower fossil and process-based emissions when compared to non-wood products.